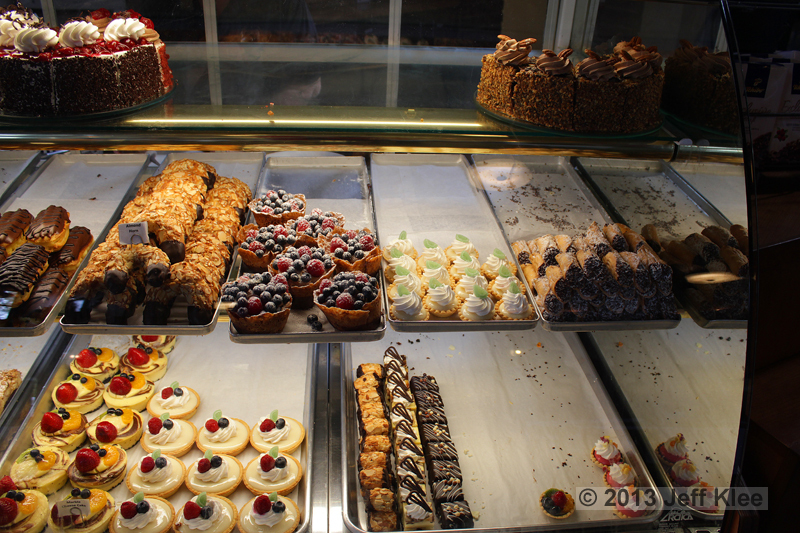 The bakery case looks much different near the end of the day compared to during peak lunch hours as you saw during my last visit. Selections become limited as it gets picked clean throughout the day. My wife decided on one of those praline baskets in the middle. 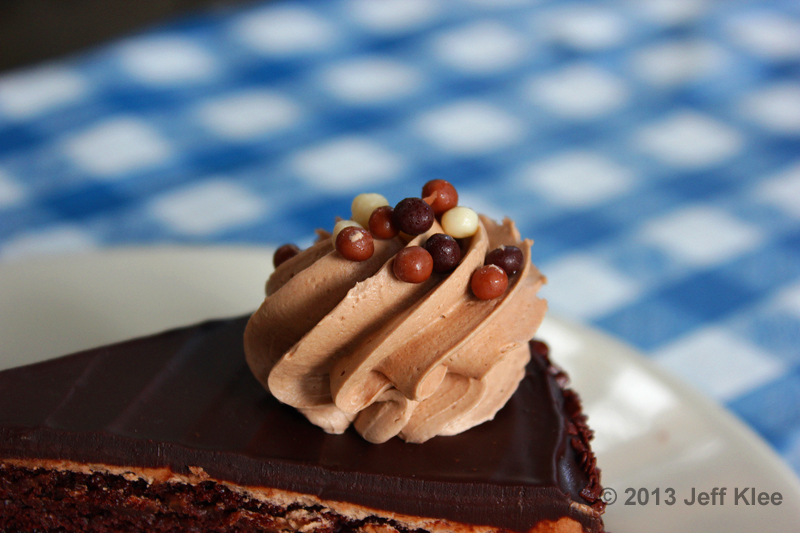 I was counting on this triple chocolate cake to quash my chocoholic cravings. 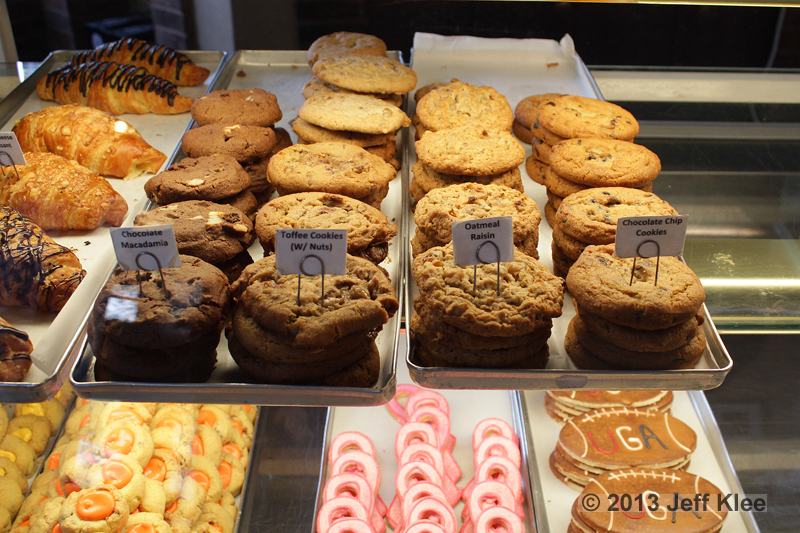 A friend of mine had raved about the cookies here, particularly the toffee cookies. I thought this was a good time to try them since I was just snacking during today’s visit. This praline basket was not the first I’ve seen. 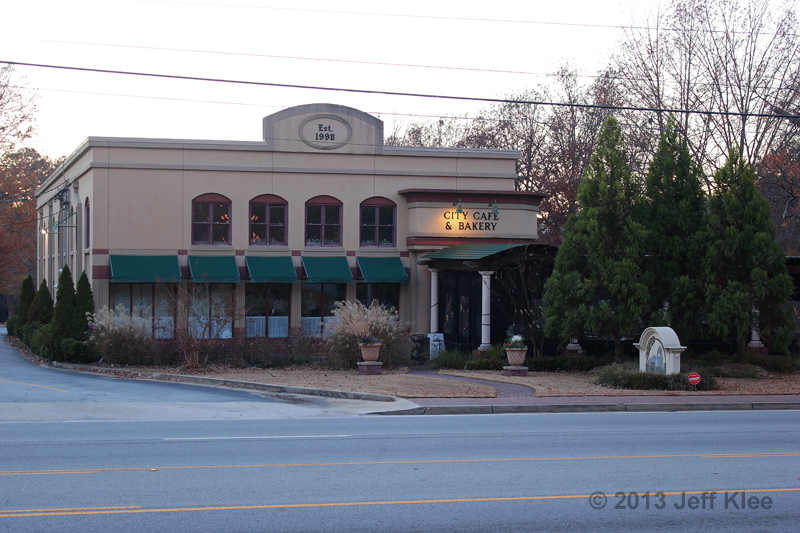 You may remember my review of The Old Pink House in Savannah, where I was surprised by a similarly unique dessert. This praline basket may have been similar on the outside, but the inside contained completely different ingredients. The whole dessert was about as big as the palm of my hand. As with any dessert eaten in the restaurant, the plate is beautifully decorated, in this case with a star pattern of chocolate and caramel lines, tipped with drops of raspberry sauce. 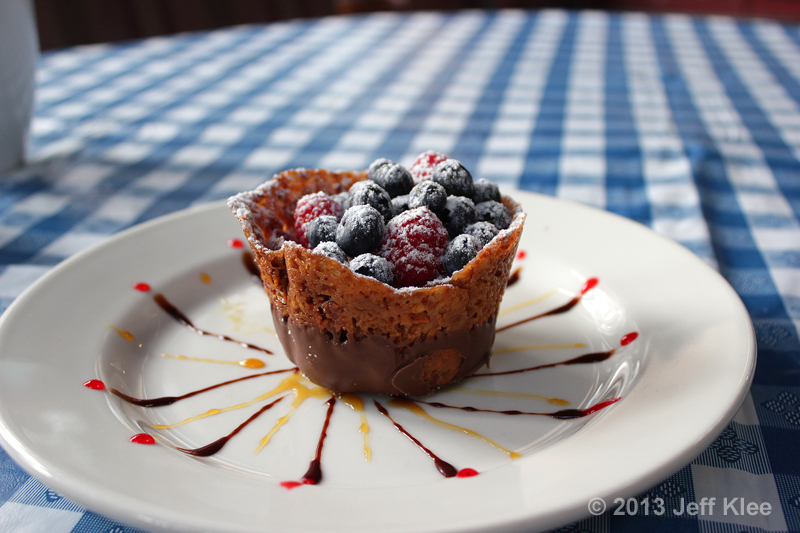 The basket itself is made of praline, and its base is dipped in milk chocolate. The basket was the perfect praline combination of sweet and crunchy. It had a bit of a granular texture. 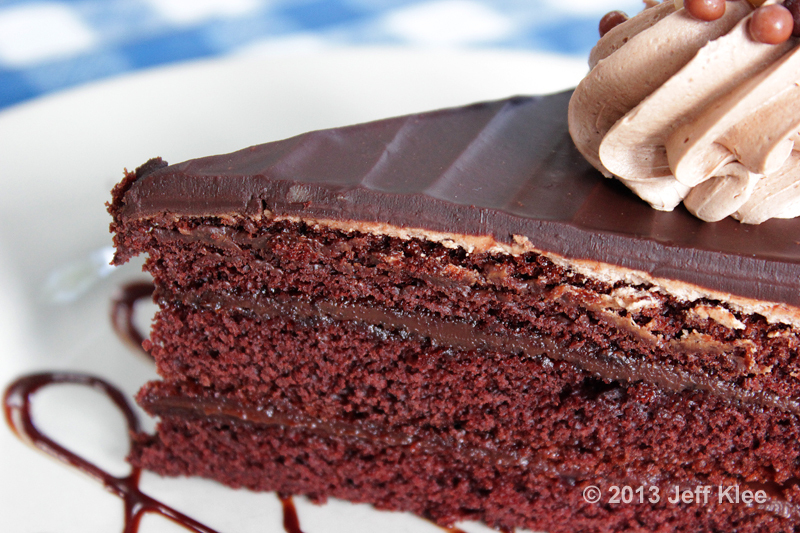 The chocolate base added a different, but additional sweetness. If you’re one who could find a dessert to be too sweet, then this delight may be a little too much for you. 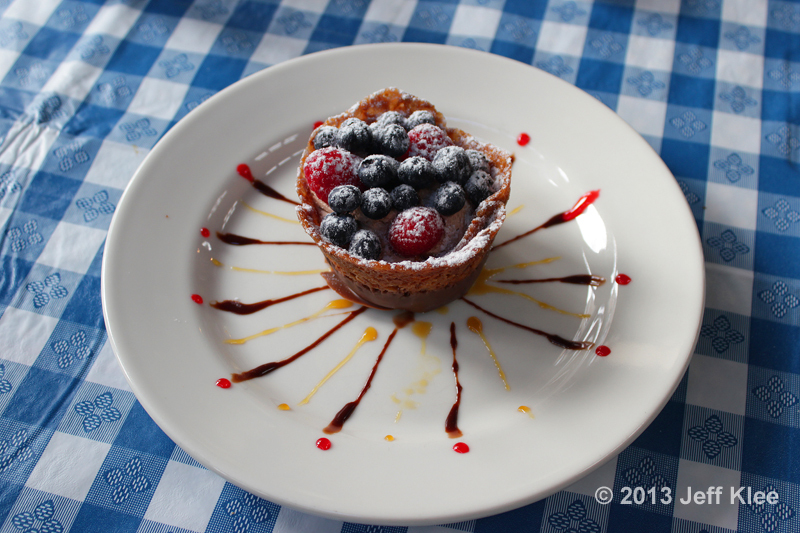 The basket was topped with a colorful, deep layer of fresh blueberries and raspberries. These semi-sweet fruits were then covered in a dusting of powdered sugar. But the berries were not the only thing filling the praline basket. 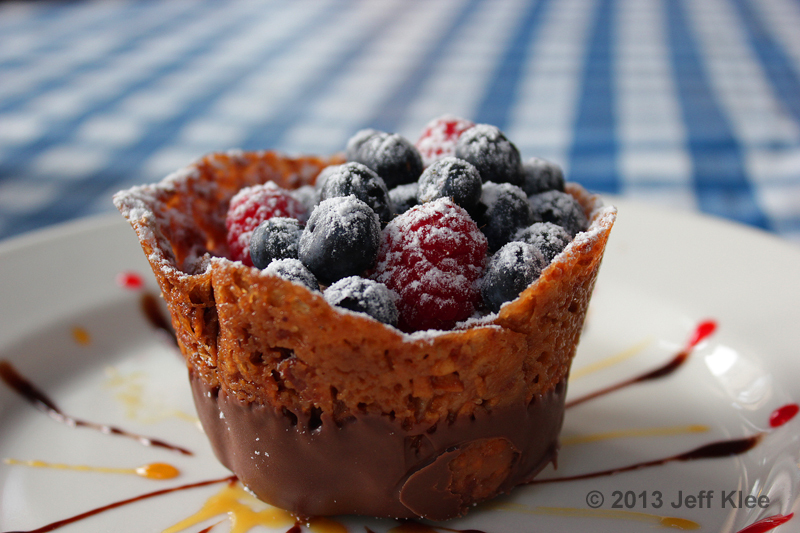 A thick layer of light chocolate mousse was the main ingredient inside. This mousse was not rich. It had a lighter chocolate flavor, which was perfectly fine as the rest of the praline dessert had plenty of strong, sweet flavors to distract me. I’m not one that would ever find something too rich or too sweet, but I could see this packing a bit of a punch if they had put something like a chocolate fudge as the main filler. While this wasn’t my personal dessert, I got to try a few bites, and my wife and I both agreed that it was well rounded. 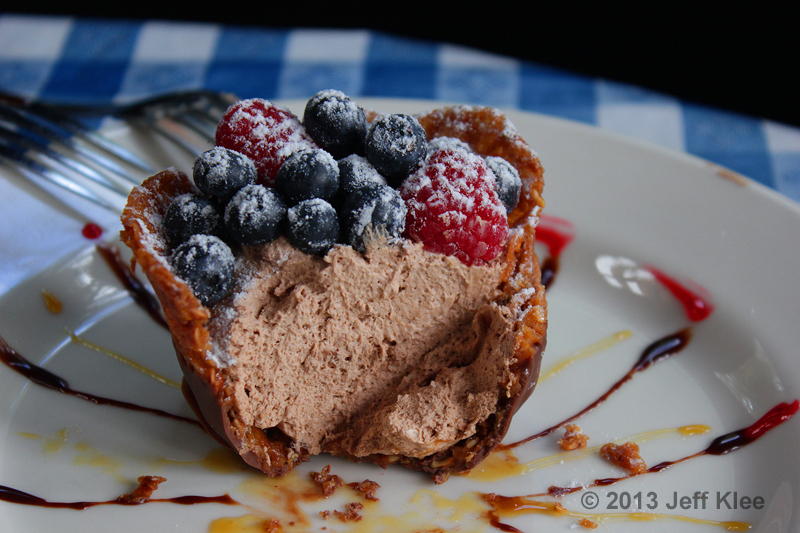 It had a deep sugar-coated cup, dipped in sweet chocolate, topped with fresh, semi-sweet berries, and a light chocolate mousse filling that all came together in a mix of dessert quality flavors. This is definitely something I’d order for myself. I picked one each of three cookie flavors: chocolate chip, oatmeal raisin, and toffee. All three cookies were soft, and tasted freshly baked. I thought the toffee wasn’t the strongest flavor. There was just enough discernment of toffee to be aware of what flavor I was enjoying. The oatmeal raisin had a slightly different taste than what you’d find in store bought cookies. It seemed sweeter, as if it had a sugar cookie base to it. When I kept it in my mouth, it would also sort of melt like a sugar cookie would. While it was certainly flavored like oatmeal, there didn’t appear to be any evidence of physical oatmeal while I was eating it, however it was still soft and chewy as an oatmeal raisin cookie should be. The last surprise was that it first appeared to be missing the raisins as well, until I realized that they used white raisins which blended in with the cookie. It was the same taste, just different color. 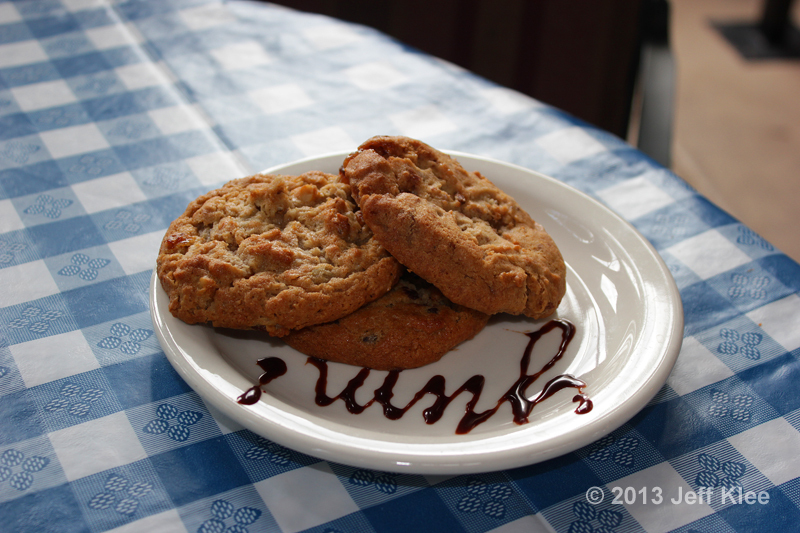 The chocolate chip cookie was pretty standard. Just like the others, it seemed fresh, and was soft and chewy. All three cookies were good, but not exceptional in any way. I wouldn’t put them above any other homemade cookies that one could make in their own kitchen. My other choice today was the Triple Chocolate Cake. The serving was a medium sized slice and came with the standard chocolate drizzle to slightly improve the presentation. 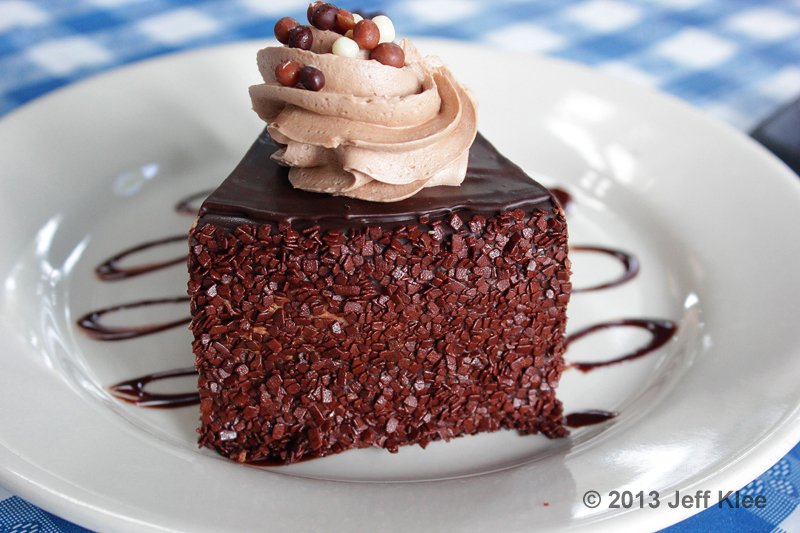 There were three layers of moist chocolate cake, separated by two thin layers of rich chocolate fudge. I enjoy cake, but it’s not something I really crave. It’s usually the additional toppings like fudge, icing, and assorted candies that I love the most. This cake was limited on the middle fudge layers and consisted mostly of cake, but was remedied slightly by the marginally thicker layer of fudge icing on the top. Another advantage this cake offered was the outer icing layer. The fudge icing was buried under a full coating of small chocolate squares. They may look small, but don’t let their size deceive you. These mini chocolates had a nice substantial taste that could burst through the fudge icing. If these had been mixed with the cake separating fudge layers, it probably would have been one of the better cakes I’ve had. 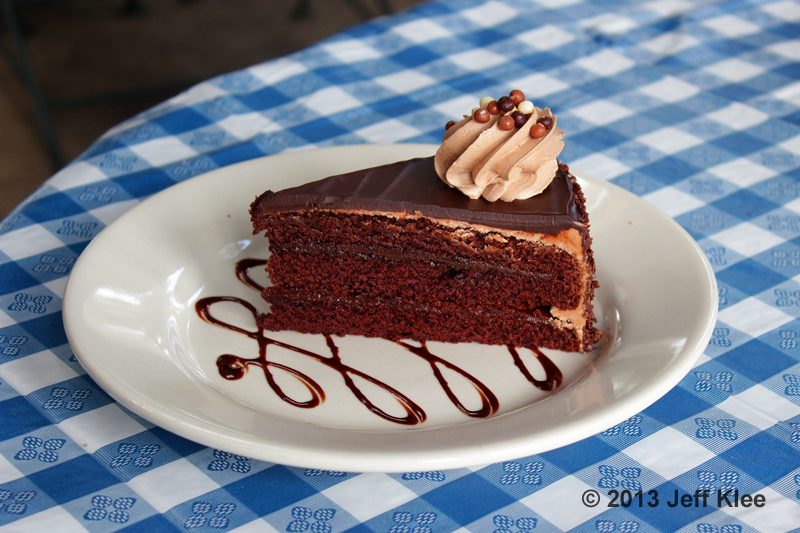 The slice was garnished with a glob of chocolate butter cream frosting that had a fairly rich chocolate taste. The frosting was dotted with small brown and white dragées, which are the decorating balls made out of sugar that have a hard outer shell. 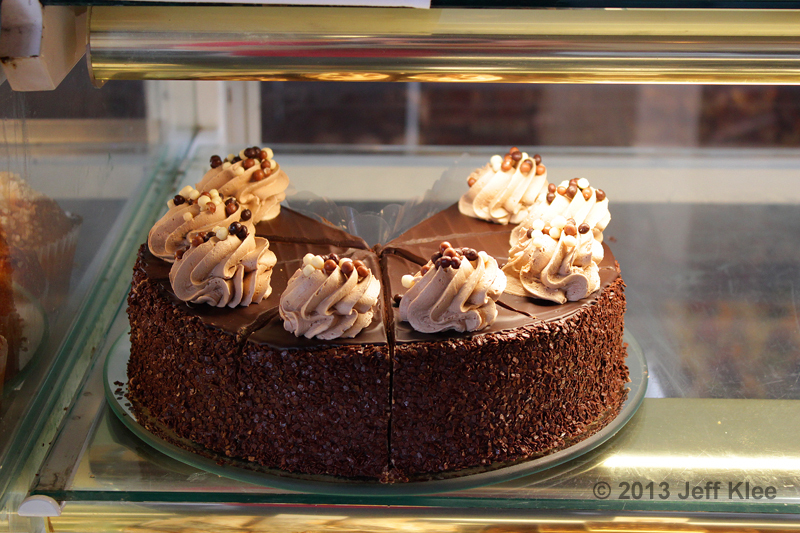 While I would have liked to see thicker fudge layers, or a thicker fudge topping, overall the cake slice had a nice solid chocolate taste all around. The cake itself was very moist, which eliminated my most common disappointment with cake. I also was very satisfied with the chocolate squares covering the outer layer. It wasn’t perfect, but it was a darn good piece of cake. 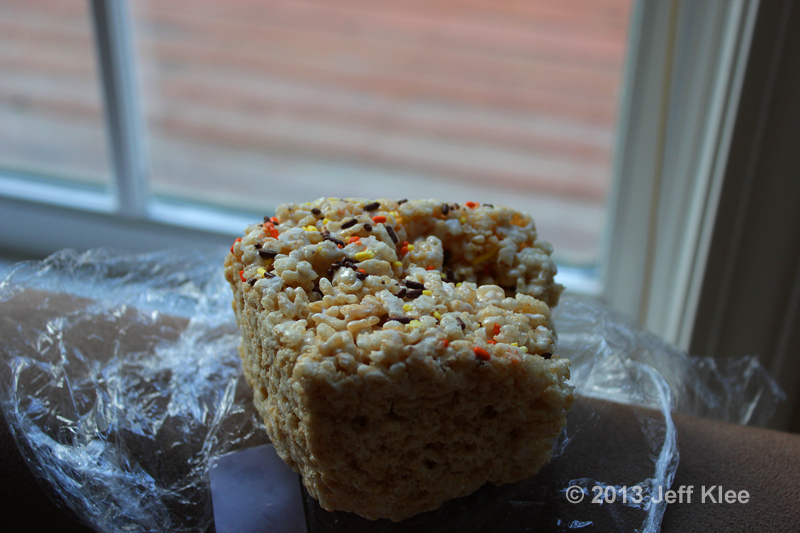 Finally my wife and I got a Rice Krispies® treat to eat once we got home. It was a really large brick that was wrapped separately in cellophane. They keep these on the counter above the bakery case. 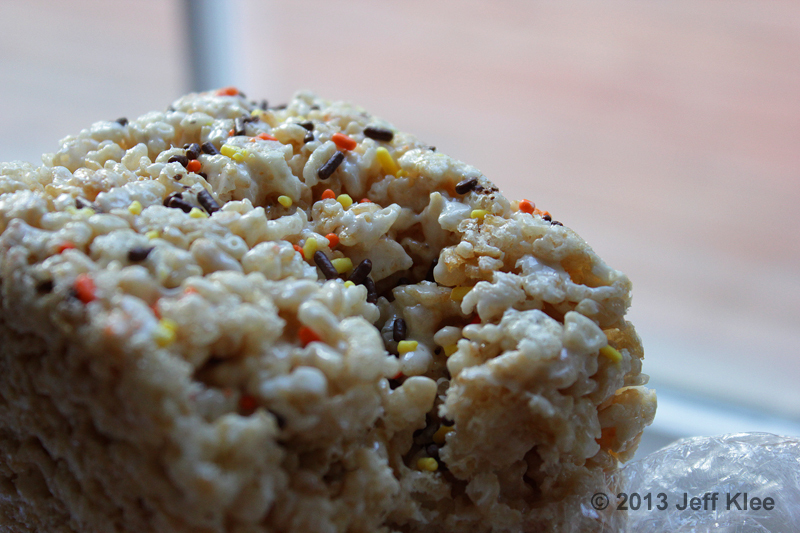 Other than a scattering of sprinkles, this was no different from every other Rice Krispies® treat on the planet. It was a run-of-the-mill mix of the cereal and marshmallow. The sprinkles didn’t add anything special. I don’t have any complaints however, I wasn’t really expecting anything out of the ordinary. It was really just something additional to bring home, but still allows me to check another item off the list. Today I was just snacking on a quick dessert, and chose a few items that I knew were fairly ordinary. The not so ordinary foods (the cake and praline basket) were very enjoyable as expected. I would have loved to have gotten more out of the cookies, but still can’t complain as they certainly weren’t bad. I look forward to the next meal where I can sample additional menu items.